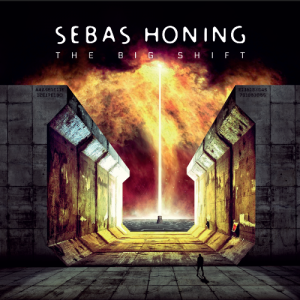 Sebas Honing is a multi-instrumentalist who hails from The Netherlands. Sebas is also a composer and producer, as well as being known for his guitar work in Equisa (prog metal) and 5150, a Van Halen tribute band. Together with his partner, Petra, he also fronts the acoustic duo, Mr. and Mrs. Honey. With all this going on, it makes you wonder where he finds the time to release solo material, with his latest offering being The Big Shift. This release follows on from Songs of Oceans and Seas, a concept album relating to water, and From Middle to East, another concept album tracing a journey from Turkey, through India and on to Indonesia. The former follows a musical journey through rock/pop to prog rock/metal with the latter combining prog rock/metal with traditional music from the countries the journey passed through. The band formed to record The Big Shift, also led to the formation of a live band which will have debuted on the 24th of January this year. The four people involved in the recording of The Big Shift were, Sebas (vocals, guitar, bass and keyboards), Petra Honing (lead and backing vocals), Christiaan Bruin (drums and backing vocals) and Tessa Struijs (backing vocals). Christiaan Bruin is also a member of Sky Architect and Nine Stones Close, whilst also releasing solo albums under the name of Chris. The Big Shift is again a concept album, of sorts, but with a more personal link and relates to change that occurs at various points, such as leaving home, getting rid of fears and the birth of his daughter. The Big Shift is a 15 track album with a playing time of around 62 minutes. Tracks 1 and 15, “Big Shift” and “Lost,” form the shortest and longest tracks on offer, with the former clocking in at 1:12 minutes and the latter running just short of 6 minutes (5:48). The opening, and title, track, “Big Shift” (1:12) is an atmospheric 25 seconds before the chunky power chords erupt. Some very tasty guitar then takes the track out and into “Life (part I)” (5:13) which is a totally different “kettle of fish.” Subtle strummed guitar leads into an almost faltering, fragile vocal from Sebas, and then the track opens up when Petra’s vocals join in. The track is more band orientated from this point as the music slowly builds and there are some chunky chords before the guitar gets a chance to “run free” with some excellent soaring themes. These opening two tracks highlight the more melodic, almost pop styled areas of the music as well as the more metallic sections and it makes you eager to hear the rest of the album. Tracks 3 and 4, “Ditching Fear” (4:15) and “Mercury Retrograde” (4:00) continue this light/dark atmosphere before “OMG” (3:34) blasts out of the speakers as a riff-laden thumper of a track together with a more strained version of vocals. “All of You” (4:06) quiets things down by several notches and “Freedom” (4:47) is a slow building track, neither being reliant with the more metallic side of Sebas. “Mild Smile” (4:48) is another of the gentler examples from Sebas although the latter part of the track ramps up the soaring guitar melodies again. “Full 180” (3:04) is a rampaging, thundering track which drives out of the speakers and pummels your ears. Cue a total change with the next track, “Flickering Heart” (5:22) which demonstrates the ease with which Sebas can move from the light into the dark, both between, and within, tracks. The penultimate track, “Life (part II)” (4:52) is another thundering rocker before the finale, “Lost” (5:48) which is an atmospheric moody track with bursts of metal to accentuate the sections within the track. The Big Shift is an excellent album which seems to have used the previous 2 releases as stepping stones to a new level. The Big Shift effortlessly fuses areas of lighter and darker moods across and within the 15 tracks. One moment you are listening to the gentler, laid back music, but Sebas has the ability to “up the ante” so quickly and seamlessly, that you realize you are listening to a musician who is very confident about what he is achieving. I found The Big Shift an extremely enjoyable 60+ minute listen and would suggest giving the album a few plays. It is unlikely that you will feel any pangs of disappointment.